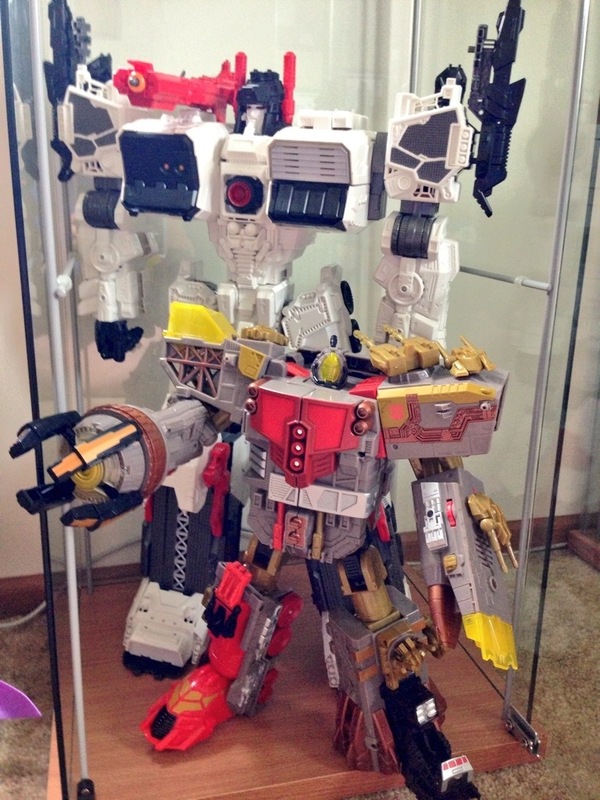 And Year of the Snake Omega Supreme. And here’s how he measures up with the legends class. Heh…or how they measure up with him. 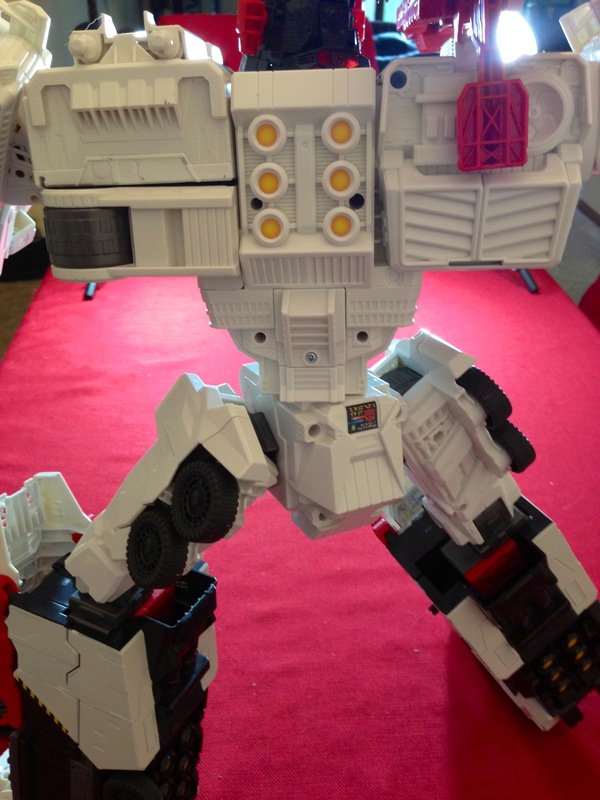 Metroplex has some amazing detailing worked into his mold. 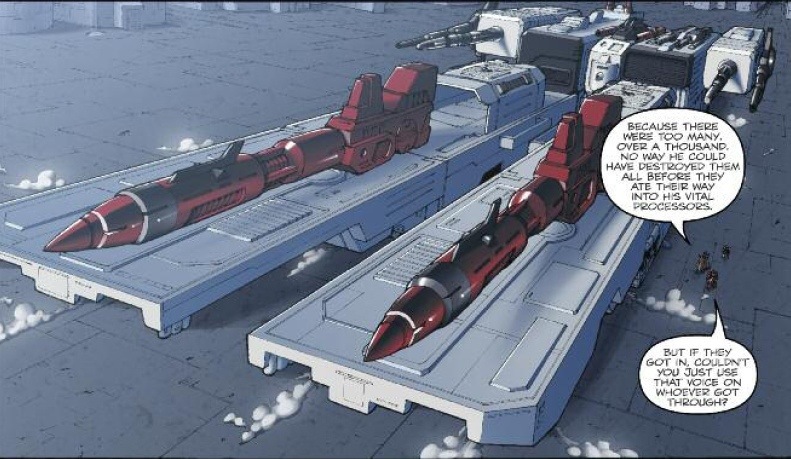 Because he’s based on the Fall of Cybertron iteration, he has an electronic light up gimmick with a very game accurate voice, quoting some of his lines from the game. He features moving pupils that are controlled by a tab in the back of his neck. Unfortunately as you can see from the picture, you can only see them when the light up gimmick is active. 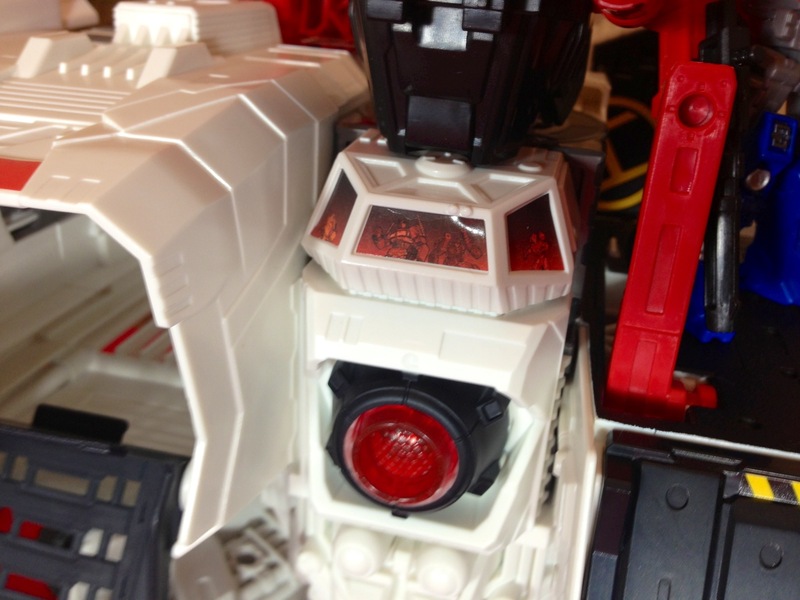 He also features some great stickers – on the chest you can see Prime, ‘Bee and Arced in each window. 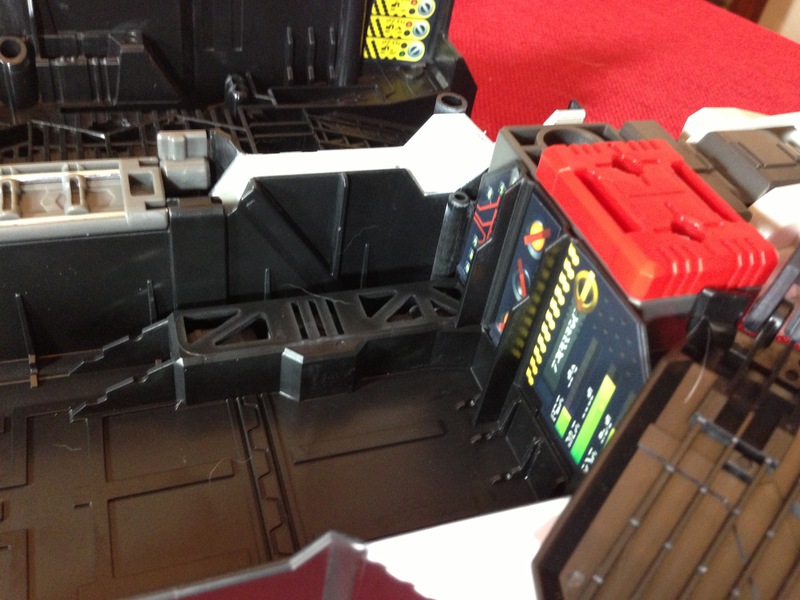 And cool thrusters on back as we’ll as the G1-like red striping. 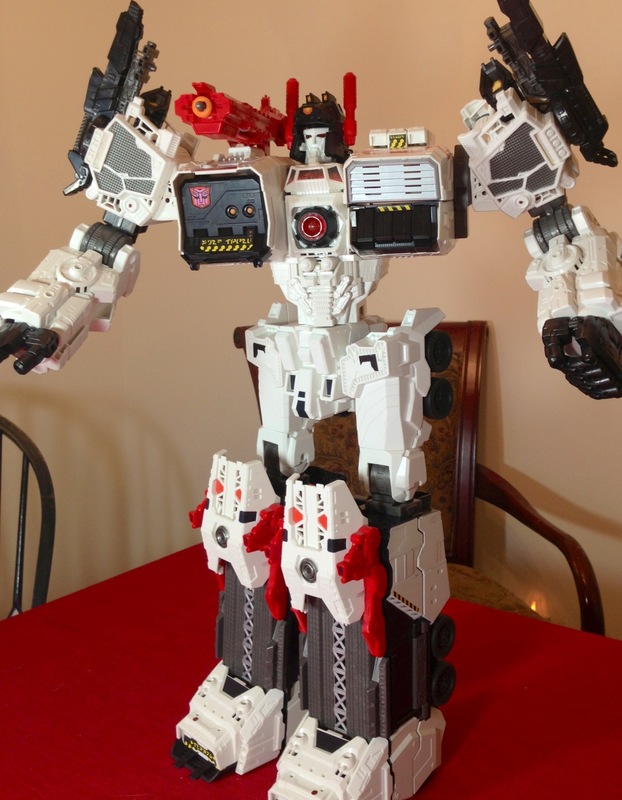 I do hope we get a Reprolabel upgrade set for him. 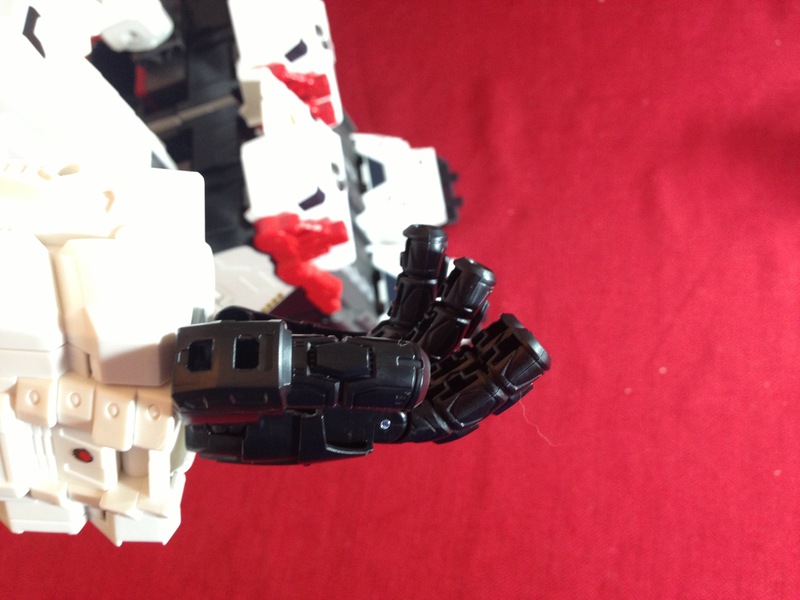 The hands are quite nice, with each finger being articulated. I feel that the fingers could have used a knuckle joint too, but that’s a very minor complaint. 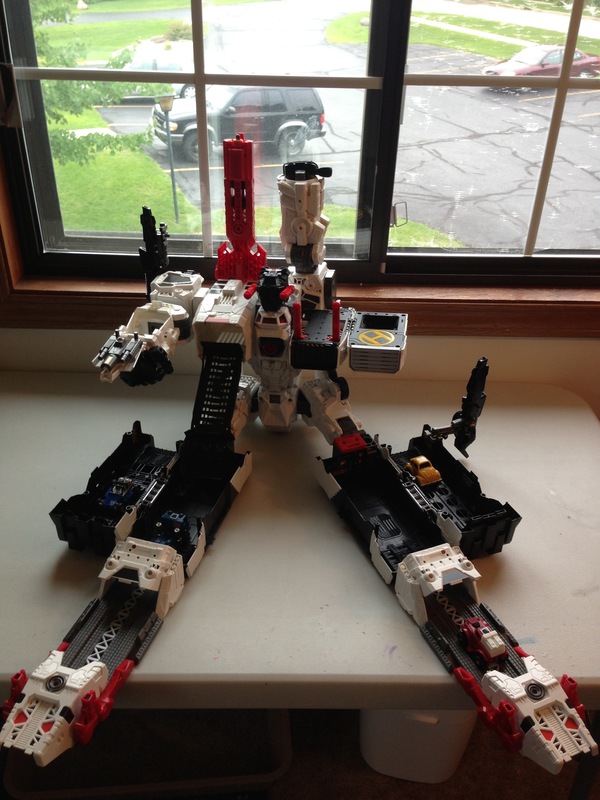 There is a cannon built into his left shoulder, than can be maned by a legends class figure. 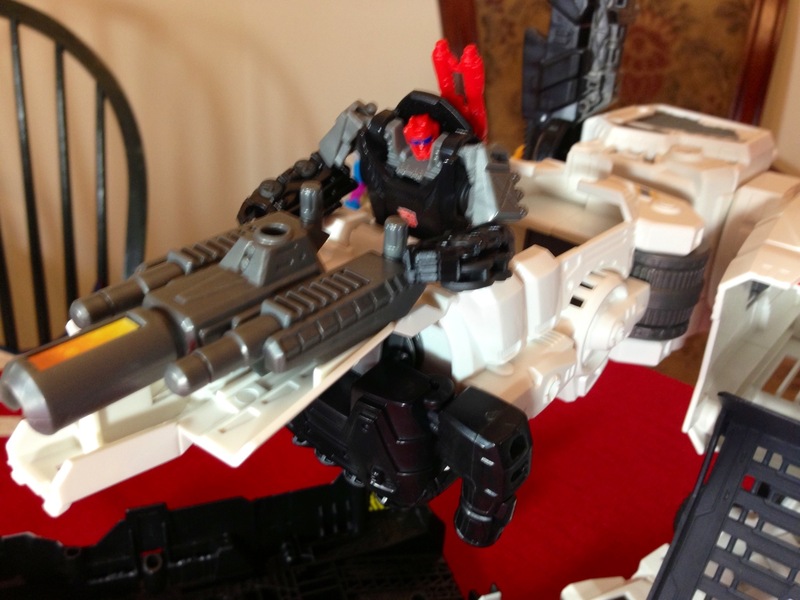 He is specifically designed to work with the new legends class figures. 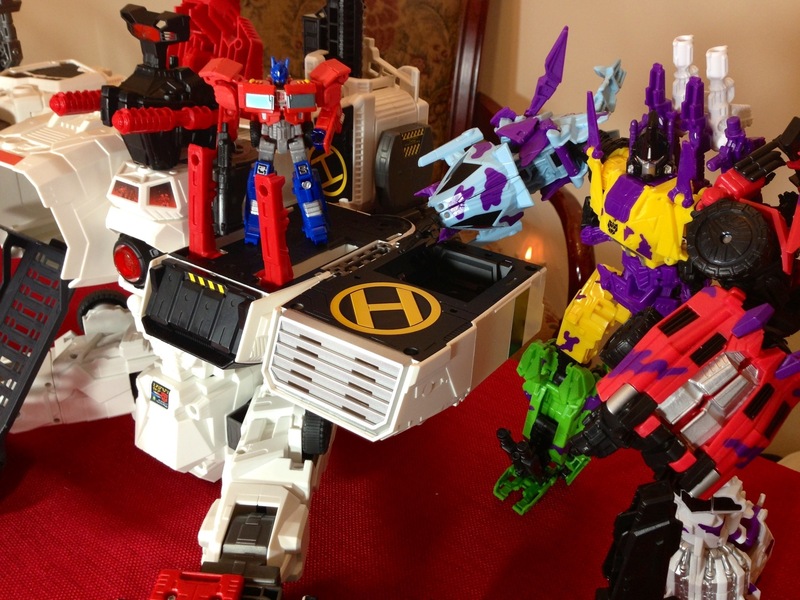 And seems we have confirmation from Botcon that we’ll be getting more of them, that’s a very good thing. 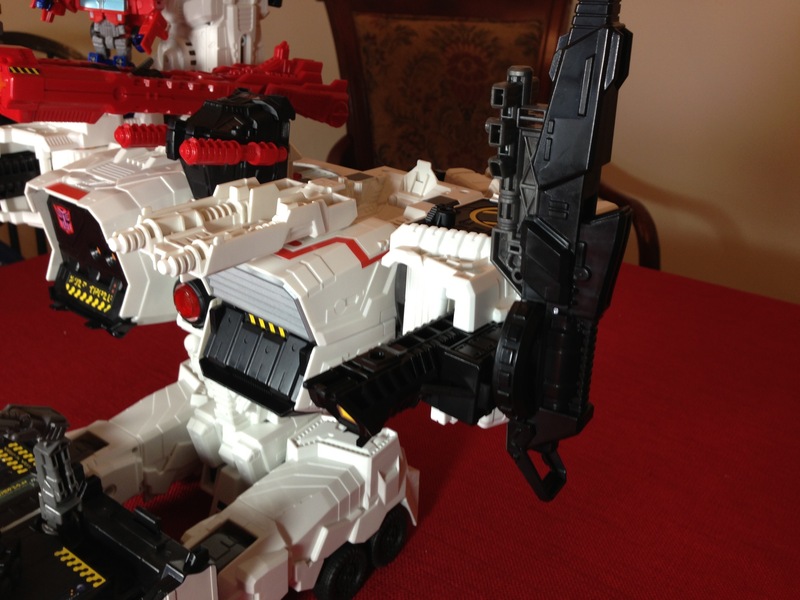 First – the neutron cannon from the FOC Game is built into the right arm, again fully accommodating a legends class. The hands do not get very well hidden but they at least have a double joint in the wrist allowing them to fold under. The “knee cap” sections no longer have to be removed but form the first overpass on the “freeway” lanes. 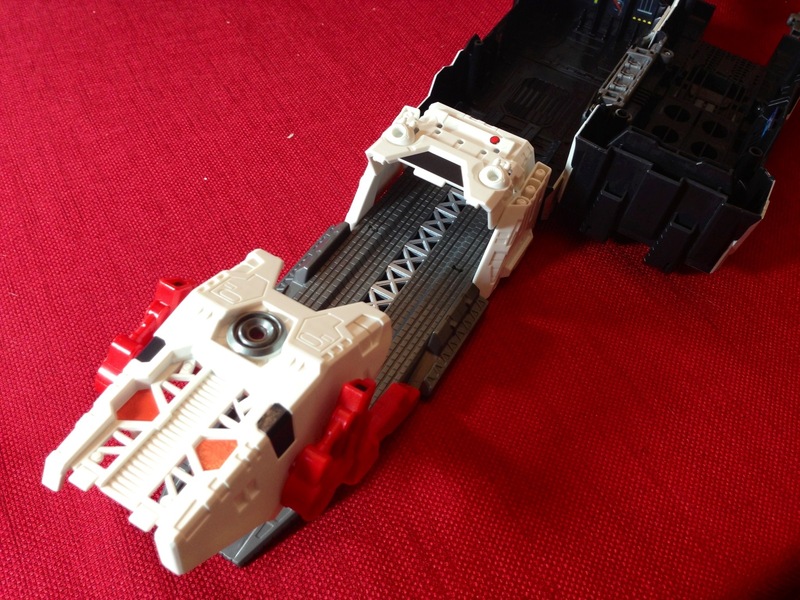 The feet also form gates, which is quite cool! Again, there are a lot of really nice stickers throughout the entire figure. The head no longer collapses into the body (mainly because of the electronics) but instead, the “helmet” section rotates forward to cover the face. 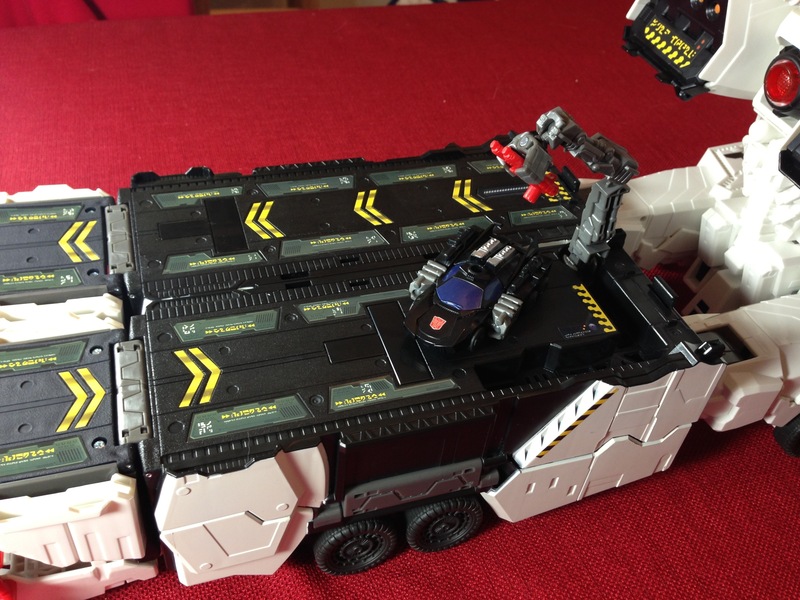 It’s quite a bit more successful than the G1 versions attempt to hide the head, and there is a panel that flips up to resemble a terminal or command post. 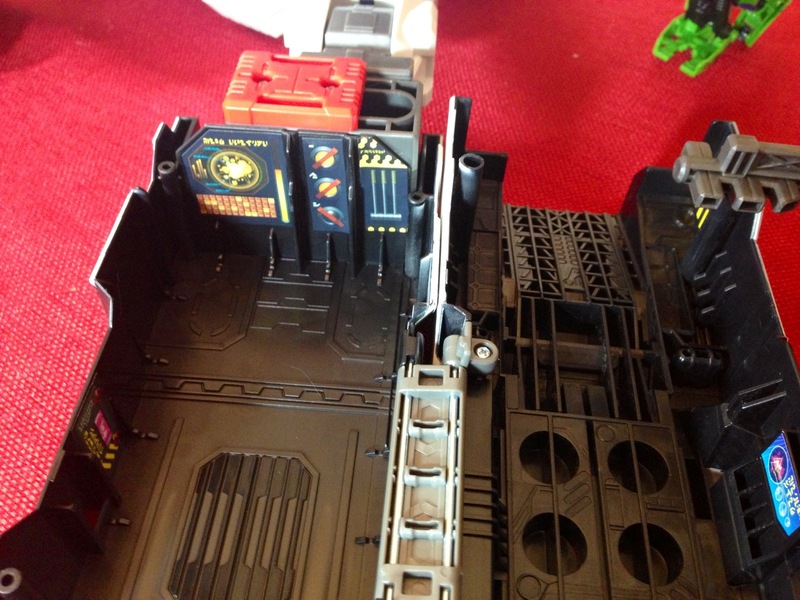 There are a few added parts to the helipad area, and even though I didn’t have it open the missile bay still flips open as well. Dudicus even good attacking the city! And frankly, the big guy has some saving graces to help him out! 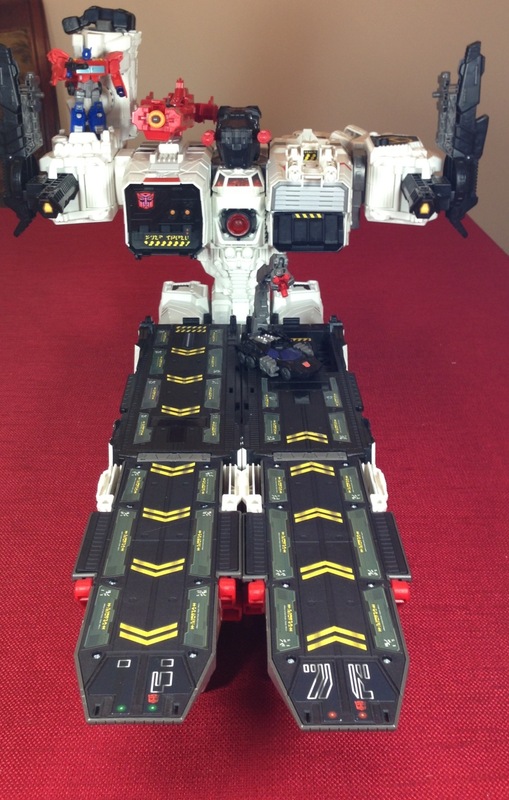 So for a boring mode, Metroplex pulls it off quite nicely! 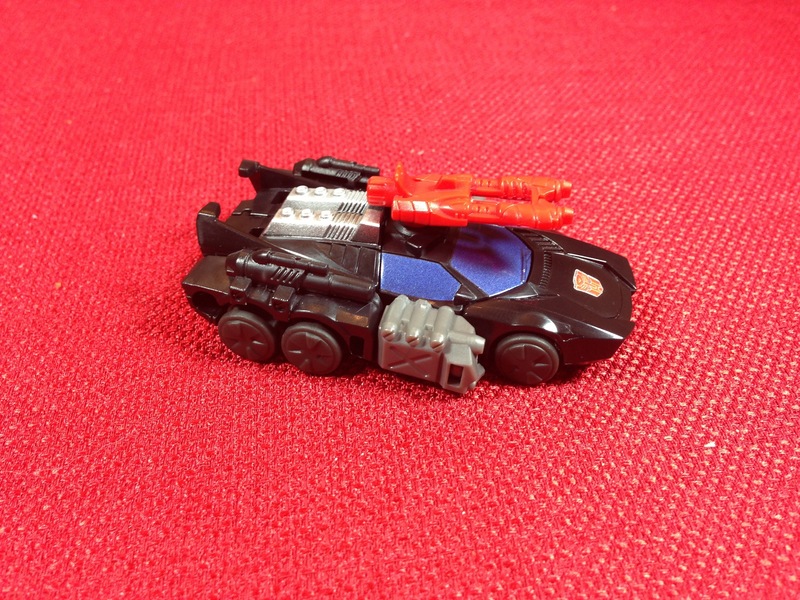 As if the big kahuna wasn’t enough, we also get a legends class sized Scamper! And whoa bully! Do I have the eyes for him! 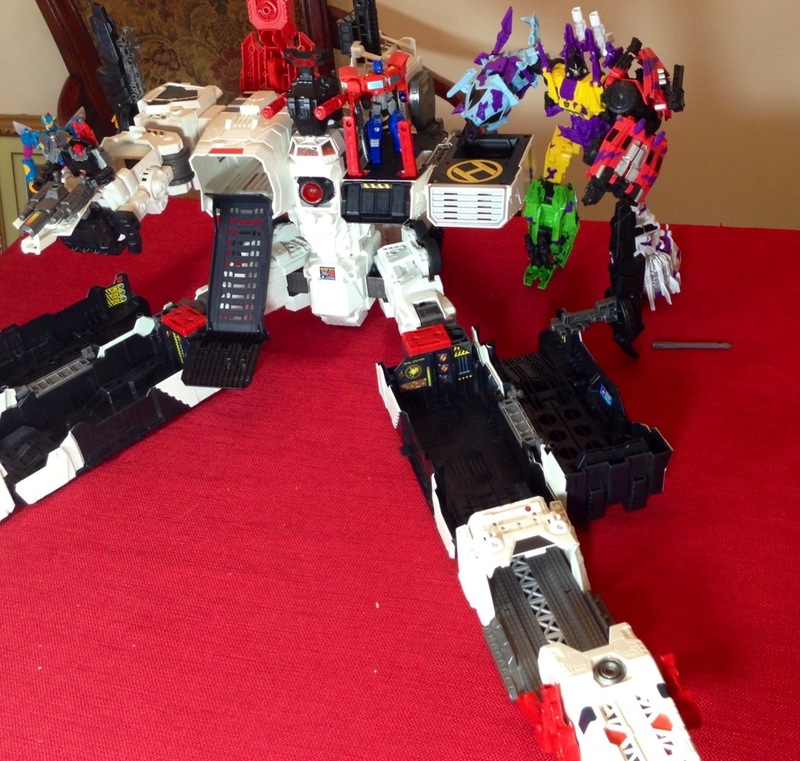 See for me, as a kid growing up with the original Metroplex, frankly, I couldn’t have cared less for MP himself, but I took Scamper EVERYWHERE. I don’t know what it was about him, but I loved him! 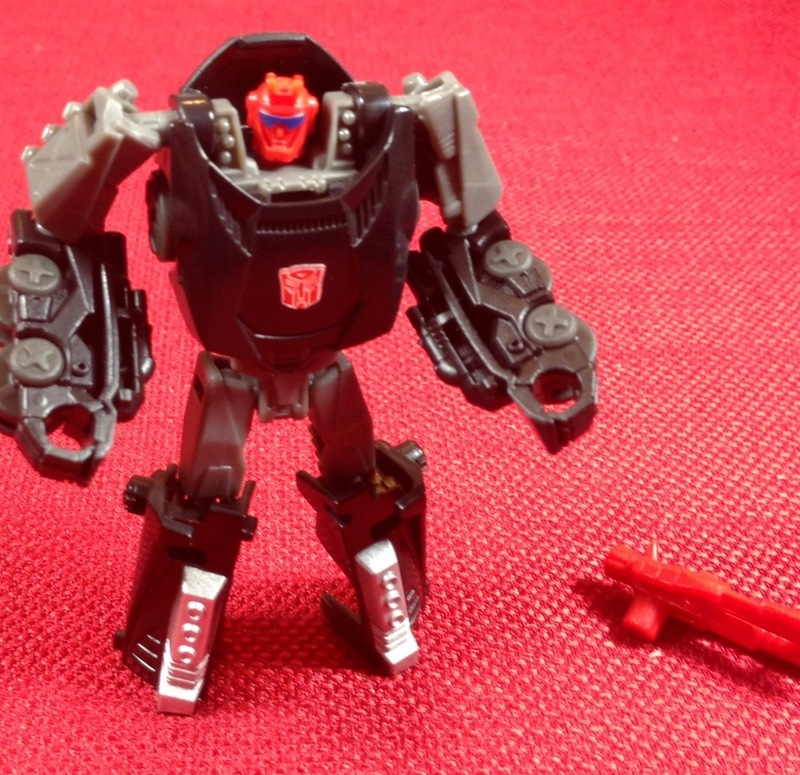 So when I first saw the initial pictures of the NEW Scamper, I was less than enthused, as he looked like a simple repaint of the piece of garbage “clocker” mold with a new (and for some reason, red, head sculpt). 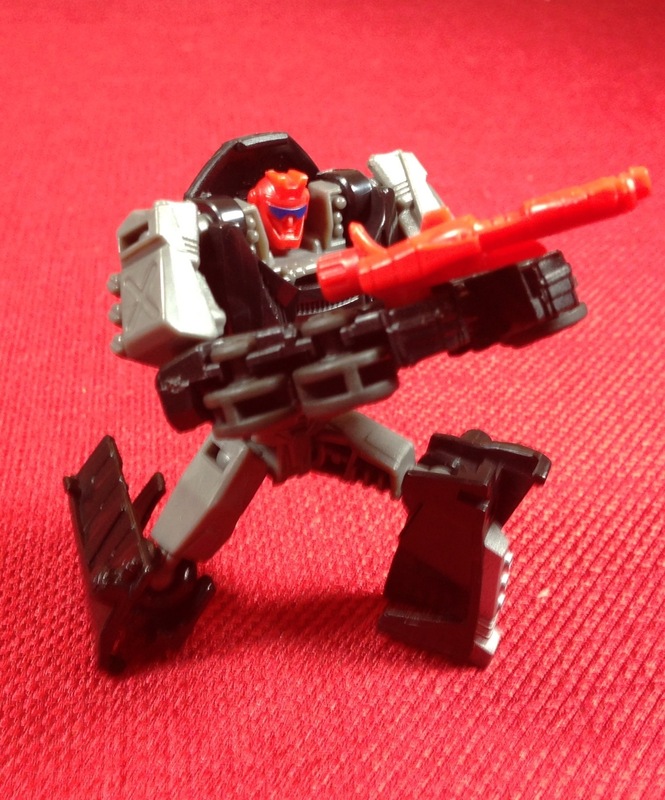 As luck would have it though, he’s not a repaint, and he’s totally awesome! And once again, I want to take him everywhere! 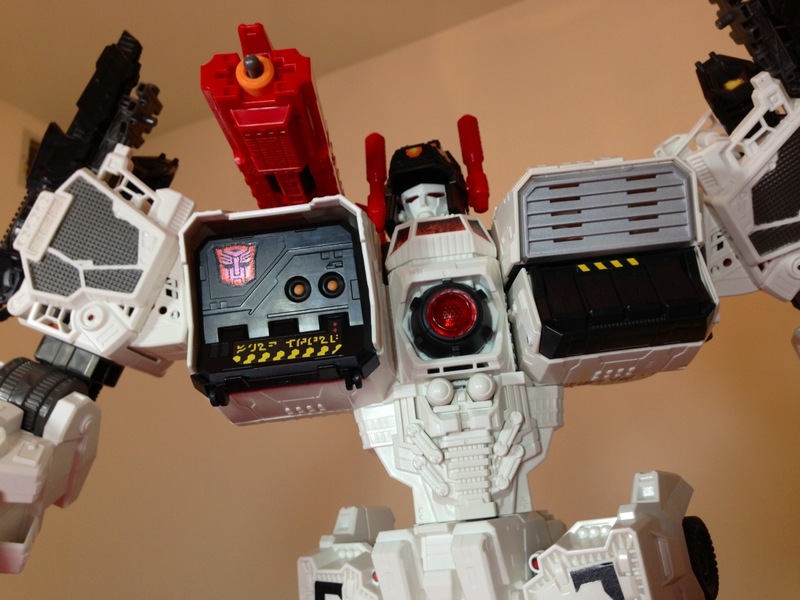 While he has a simple transformation, he’s exceptionally poseable, and a lot of fun! 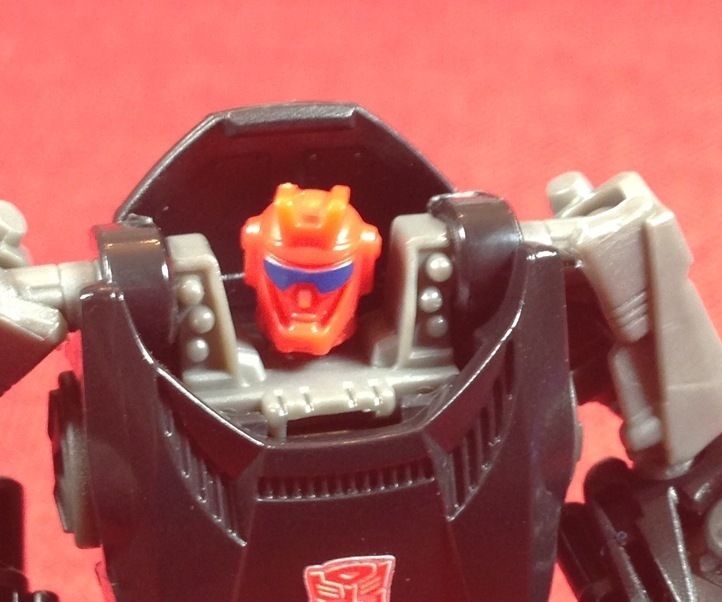 As for the head-sculpt, while I still don’t understand why they made it red, I’m really digging it a lot! Basically, this entire post has been to elaborate on one, conclusive thought: BUY THIS THING NOW. You can’t go wrong with him. 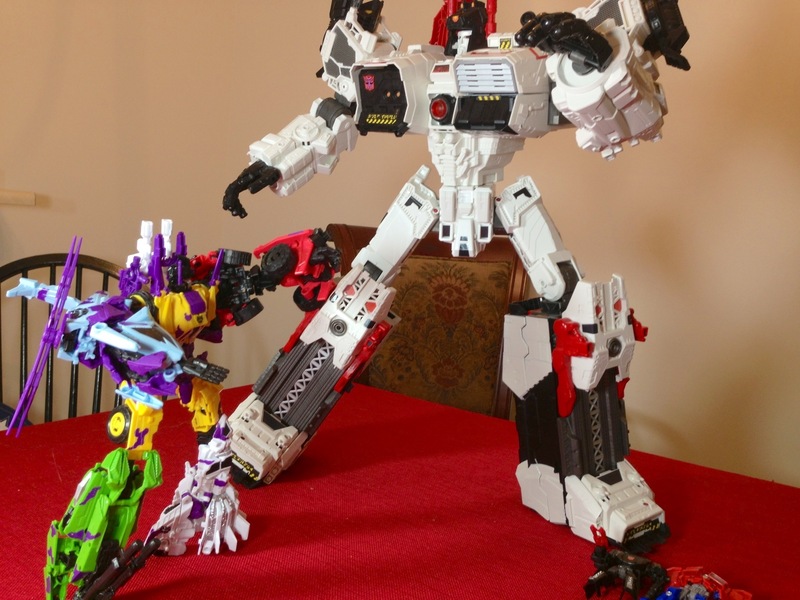 He’s big, he’s awesome AND he sends the message to Hasbro that they’re doing the right thing by making this sort of toy available. Need more convincing? Well, while it’s not guaranteed, the likely hood of us getting: 1.) 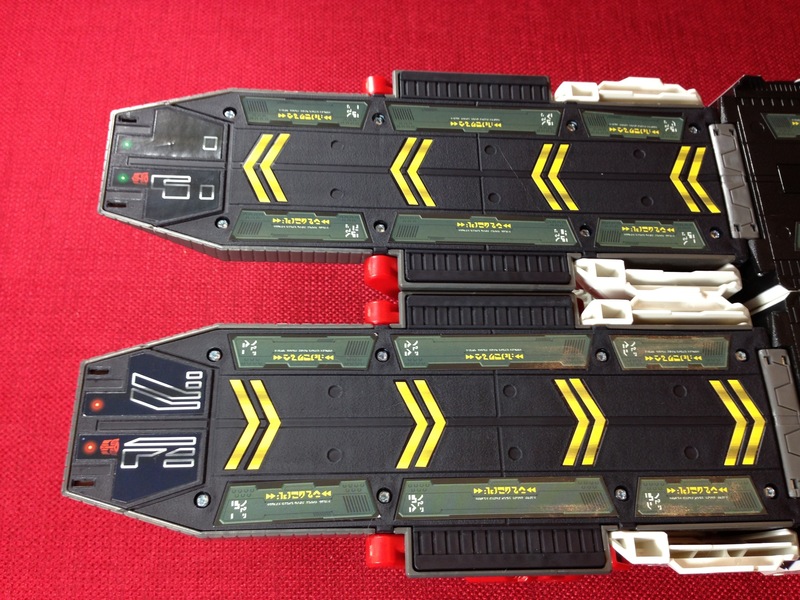 An upgrade Reprolabel set, 2.) 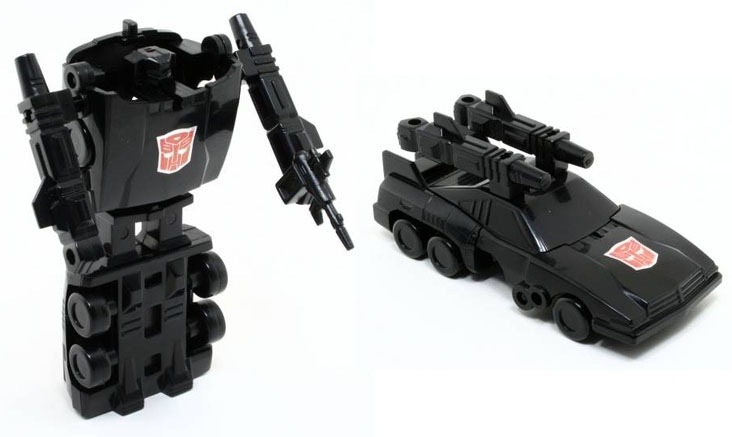 a 3rd party Slammer (the little tank) and Six Gun, and 3.) possible upgrade part from a 3rd party, and finally 4.) 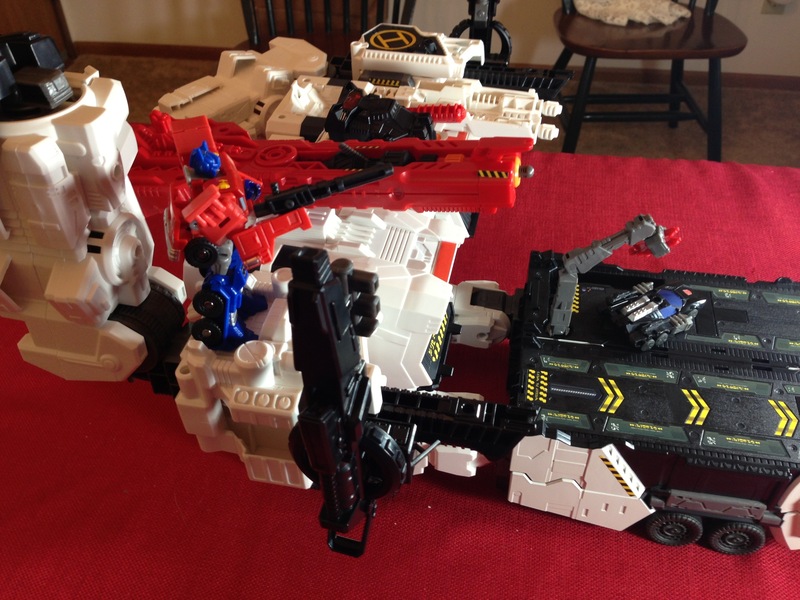 A repaint by Hasbro or Takara as Metrotitan are ALL very high. Here’s Part One of the video review – don’t forget to subscribe and watch the other two parts as well! Stay tuned for more, there’s a lot of stuff to cover, including the upcoming TFCON trip! 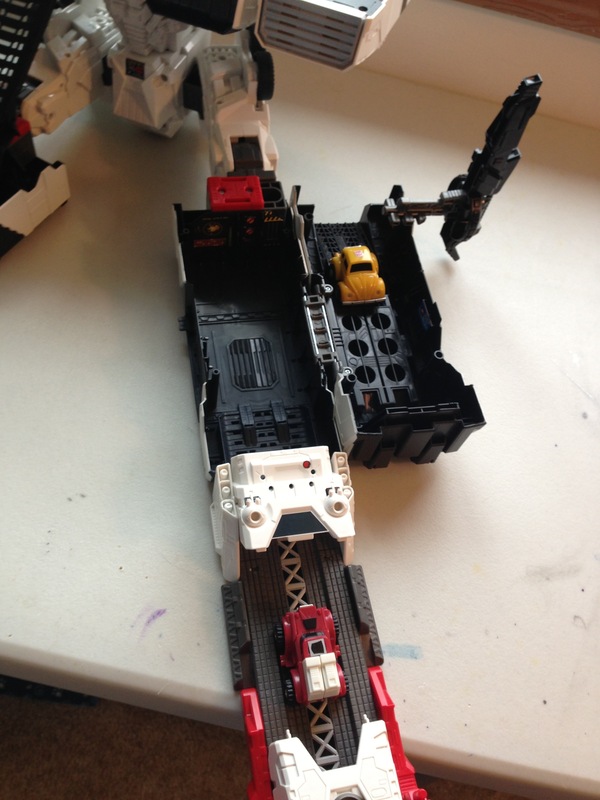 Previous Post: PaxCybertron is heading to TFCon! 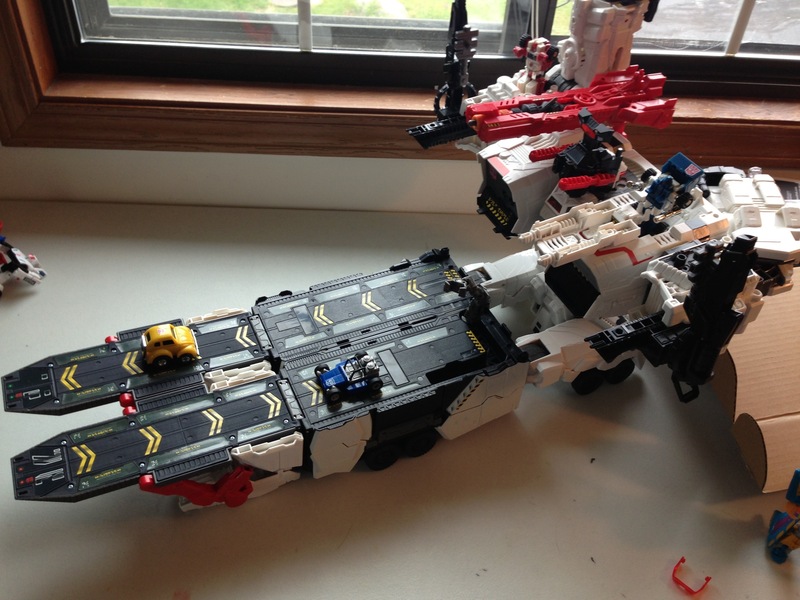 Pingback: Generations Titan Class: METROPLEX | Korewa Gundam! Such a massive beast. Such massive win. 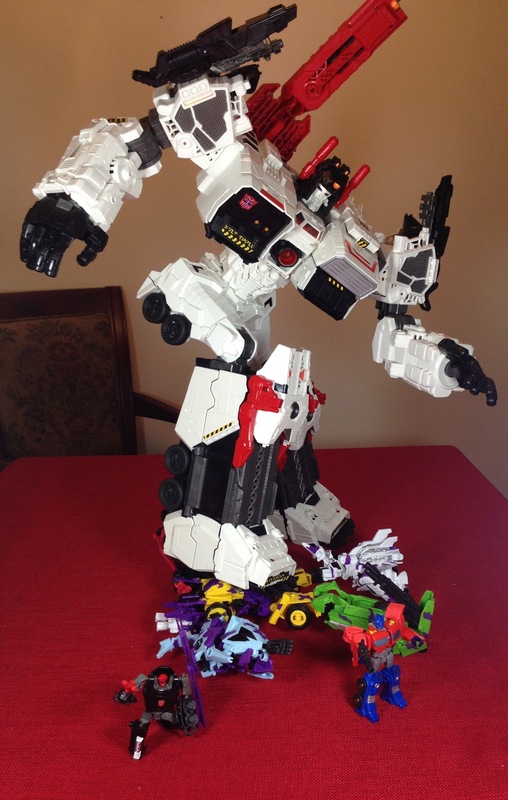 Though I have no idea where I’d put a bot this size, I’m soooo tempted to get him. As much as I don’t like putting on stickers (unless they’re a reprolabels upgrade), ‘Plex’s stickers really make a big difference. They add so much little detail (I love the Arcee, Optimus, and Bumblebee on the chest) and really enhance the product. I always loved Scamper when I was little too. 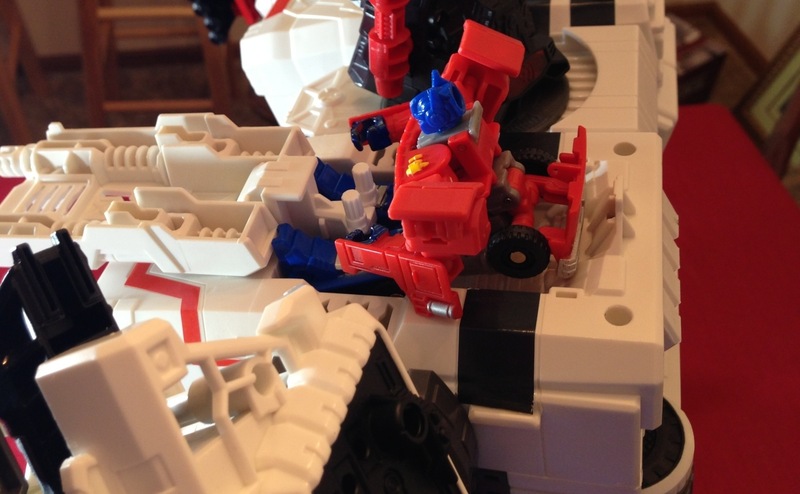 Maybe you can do another travel blog with Scamper (like you tried with Ravage). He can make a trip to Canada soon…. That’s a really good idea actually! Maybe I’ll do another travel post! If it helps, I have mine on my work desk, alongside a bunch of files, lol. I am looking forward to him now even more! Can’t wait till next month when BBTS Gets him in! I now have a feeling I’ll need to get some Legends Class Figures just for him. For sure man! 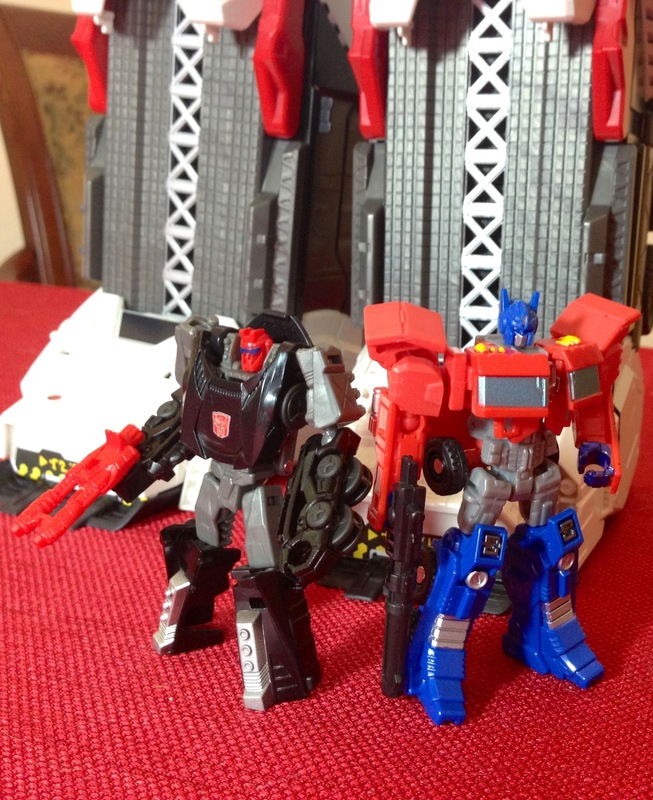 At least Prime and Megatron. Good thing I can find some Legends Class Figures Fairly Easy. 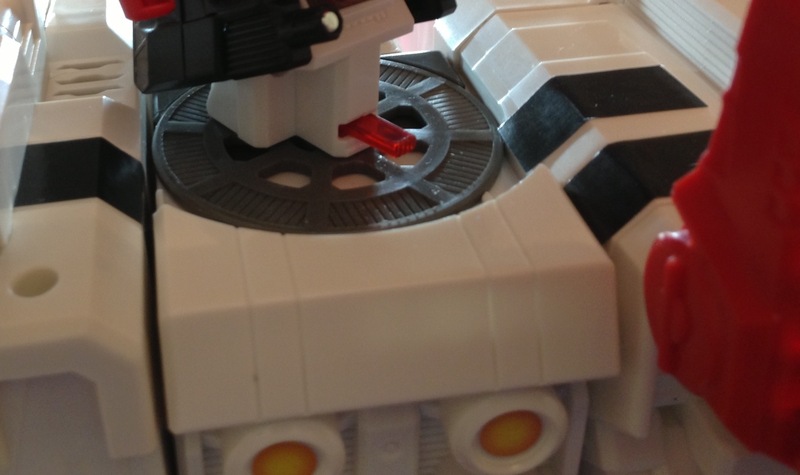 That white face is really driving me crazy, but I just can’t pony up the extra $$ for the SDCC or Takara Tomy versions. 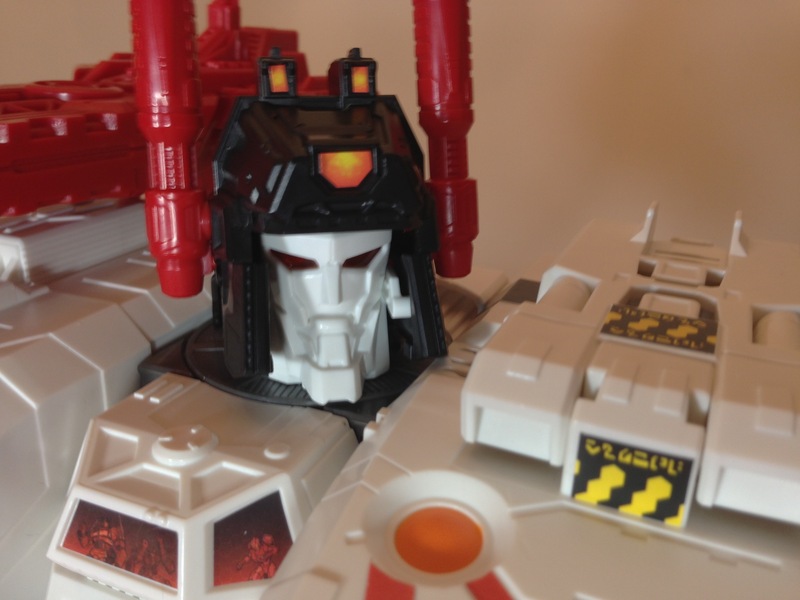 Not sure why the white would bother you, he’s got a white face in Fall of Cybertron, and frankly, I think the Chrome face on SDCC/Tak looks like hot garbage in the sun. But I suppose Diffr’nt Strokes, right? My biggest problem has been the chin, but I think your reviews have cleared that up for me. I’m not getting him from BBTS, but I think I am going to get him. I guess I don’t get what you mean by the chin. He’s quite cool, but I guess he’s not for everyone. The large, Bruce Campbell-like chin really threw me off looking at all of the promo pictures. So much so that it was a real deterrent for me. Looking at your pics, it doesn’t look so bad. Silly, I know, but it looked absurdly huge. I don’t think its too noticeable in person.